Multimodal transporter Containerships has signed a collaboration agreement with the Dutch trucking company Don Trucking in order to increase the amount of LNG-fuelled trucks in the region. 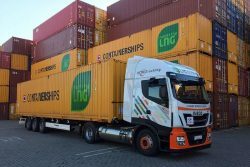 The partnership guarantees trucking capacity of 15 new LNG-fuelled trucks for Containerships’ land operations in the port of Rotterdam. “This capacity increase is an important step in our strategy to use LNG as main fuel source throughout the supply chain,” says Janne Ritakoski, Containerships’ Head of Land Operations. “Port of Rotterdam is our main hub to and from the mainland Europe. This makes the added LNG-fuelled truck capacity even more significant”. So far, Containerships’ investments to LNG-based technology sum up to MEUR200 and include four newbuild LNG-powered container vessels and a growing fleet of LNG-fuelled trucks. In addition, Containerships opened its own LNG-refuelling station in the UK last year. As a door-to-door service provider, Containerships does not limit its ambitious environmental goals to cover only the sea operations, where the newbuild LNG-powered vessels play an important role on reducing the emissions. On land, compared to Heavy Duty Vehicles (HDV), LNG offers a reduction of 25 % in CO2 emissions, fulfilling the latest proposed EU legislation of 20% CO2 emission reduction from trucks by 2025. “We strongly believe that LNG’s breakthrough is close, but the infrastructure is still premature. Our ability to use LNG on land operations depends highly on the refuelling infrastructure of the region”, Ritakoski explains. Containerships believes that both the political and commercial demand on more environmental transport solutions will only increase in near future. In Don Trucking, the company has found a partner with the same future vision and the same ‘learn and do’ mentality as Containerships. “In a project requiring high levels of expertise and innovative approach, a partner that shares the same mindset with us is essential”. Overall, using LNG throughout the supply chain saves approximately 20 – 35 % on the contribution to Global Warming compared to traditional multimodal transportation and even more than 60 % compared to traditional road transportation. Our customers with set emission reduction targets can directly benefit from these numbers and consequently contribute in more sustainable way of doing business.